Prince Harry has sent a message of thanks to the Governor-General and the people of Belize for their warm and friendly reception over the weekend. Thank you for such a warm and friendly welcome to such a beautiful country. In only 23 hours, I feel as though I have seen so much of Belize through the thousands of people who lined the way. I am hugely grateful for the very happy memories, and I’m very sad to leave. I will pass on your good wishes to my grandmother, our Queen, on her Diamond Jubilee. 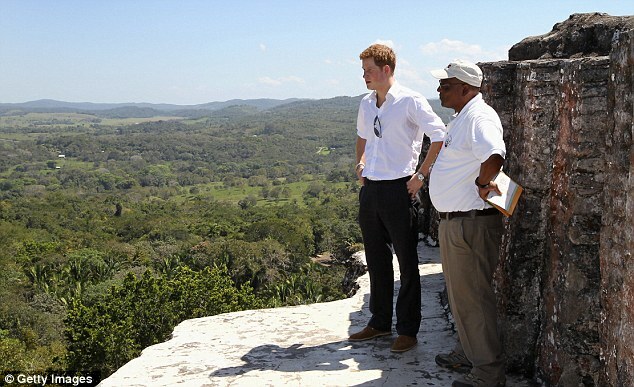 Prince Harry was in Belize as part of a Diamond Jubilee tour in honor of his grandmother’s, Queen Elizabeth II, 60th year on the throne. During the Prince’s visit he attended a massive citywide block party held in his honor at Belmopan City, the nation’s capital, where he also conducted the naming service for Queen Elizabeth II Boulevard. He also explored the ancient Maya temple of Xunantunich. I really like that young man; he's charming like his mom.